What did you love best about Earth Alone? It's a nice action novel. That's really about it. Would you recommend Earth Alone to your friends? Why or why not? Depends on the friend. Earth Alone (and the subsequent books) are ... okay. If you're into military science fiction, it's not awful. If you aren't -- well, I'd recommend people go check out exemplars of the genre first, like Starship Troopers and Old Man's War. Jeffrey, I think, captured the author's intent in dramatizing the descriptions the author left in the story. It made an otherwise cheesy story more listenable. No extreme reactions. It just sort of was. Some books are a fine, gourmet meal. Starship Trooper and Old Man's War are good examples of the genre, and it's exceedingly clear that the author is trying to channel those works. He tries to channel them so hard that it becomes derivative. This is more like fast food. It satiates some hunger, but it's not exactly nutritious. It's evident that the author knows what he knows of the military from playing roleplaying games or watching bad Hollywood movies. It's in subtle things. Soldiers rarely refer to their weapons as "rifles" or "pistols," instead using the more catch-all, imprecise term of "gun." Boot camp as depicted is very much a caricature of the real thing, and the odd million-in-one chance pairings and meetings (serving in the same unit as your foster sister? Really?) of particular characters constantly war to break your suspension of disbelief. Deus ex machina and unlikely chances abound (especially the very forced timing and outcome of the book's conclusion). Characters themselves are more caricatures. Each fits neatly into a careful trope. The angsty Leilani, the hot-headed Addy, the "old soul" main character Marco, the burly Russian "Beast," the fat kid. Each is a stereotype. The enemy is a black-and-white evil thing with zero there to lend sympathy to the reader. The "scum" are less nuanced than if the antagonist were a natural disaster like a hurricane or an earthquake. That'd likely be fine if the idea were to not distract from the characters and their own stories, but it's disingenuous in what is ostensibly a "war novel" (shades of grey with the enemy are always evident in wars, and scrubbing this reality here doesn't add any focus to the novel, as it perhaps did in Armor). Even human antagonists in later books are utterly two dimensional, like the uncreatively named Captain Petty. The plot progresses along in a forced fashion. It doesn't change by the second book, by the way, which plays out pretty much exactly as the latter half of the Starship Troopers movie did, with extremely precious little variation. It's a YA novel, at or slightly below the same quality level as the Hunger Games or Divergent -- at least those two had something of an original interpretation of older stories behind them. This is derivative. But I still read it, perhaps to punish myself for past sins. 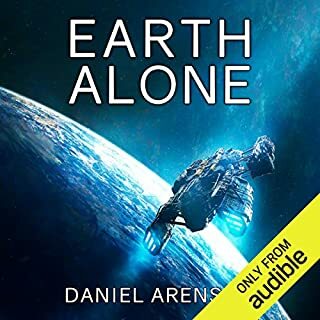 The narrator provided by Audible is a tasty sauce on an otherwise bland dish.